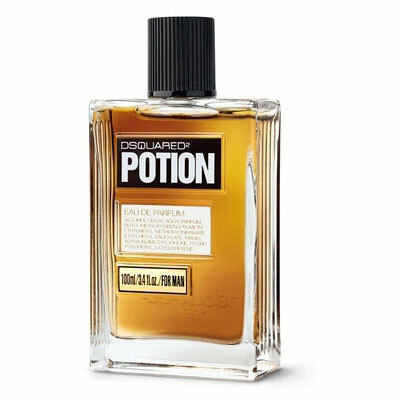 DSquared2 Potion is the second men's fragrance (not counting the limited editions) of the Canadian designer duo Dean and Dan Caten or DSquared2. In collaboration with the Italian company ITF, they launched their first men's fragrance He Wood in 2007, followed by the female version She Wood in 2008. The new fragrance is named Potion. It represents a tool of seduction, conquer and emotions and is inspired by the chemical workshops of the past. Potion is designed as a magical alchemy that evokes carnal desires and lust. The composition is aromatic woody with a distinctive background of amber. It is developed by Annick Menard. â€œA new recipe of olfactory seductionâ€� and â€œa potion of quality ingredients arousing amorous desiresâ€� is made of: Top notes: red mint leaves, angelica and thyme. Heart: rose petals, black peppercorns, tear drops of gentian and cinnamon sticks. Base: cashmere wood, patchouli, amber and musk. The packaging is inspired by the ancient pharmaceutical vials considering â€œtradition, timeless quality and men appealâ€�. The campaign was shot by photographer Mario Sorrenti, featuring models Diego Miguel and Malgosia Bela. Potion is available as 30, 50 and 100 Eau de Parfum with the extension line (â€œthe quintessence of the fragranceâ€�) of aftershave lotion spray, hair and body wash, body lotion, natural spray and alcohol free deodorant and perfume oil. Potion was launched in 2011. The nose behind this fragrance is Annick Menardo.